After the immense success of the Rang Barse Photo Contest last year at Country Club India, we're back with a bang! Anyone can participate in this contest. But before that read the following rules carefully and strictly adhere to them. All the best everybody! The Rang Barse Photo Contest starts on March 6th and the last date of submission is March 15th 2015. 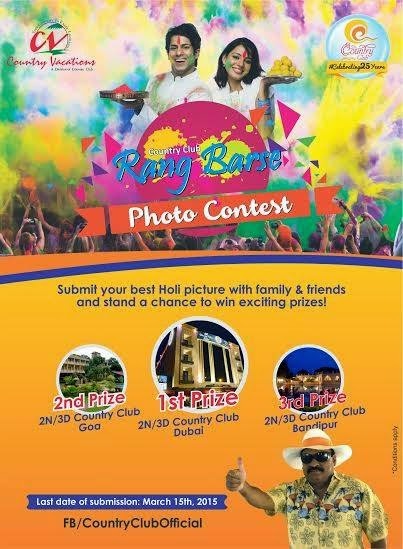 Inbox your entries on the Country Club official page or email us at myselfie@countryclubmail.com. Maximum 3 entries per person will be considered VALID. Results will be declared on March 16th, 2015. Country Club India wishes you all a holi filled with sweet moments and memories with your families and friends to cherish for a long.